This is one of the most distinguished Anglo-Scottish surnames. It is of French locational origin from the ancient castle of Saint Foi de Montgomery in the diocese of Lisieux, Normandy, or from St. Germain de Montgomery in Calvados. The name is first recorded in England in the latter half of the 11th Century, (see below). Roger de Montgomery, a Norman nobleman who took part in planning the Invasion of England in 1066, was created Earl of Arundel and granted vast estates in Sussex circa 1067. He obtained the earldom of Shewsbury in Shropshire in 1071. The former county of Montgomeryshire in Wales received its name from the Norman territory, the component elements being the Old French "mont", a hill, plus the Germanic personal name "Gumaric", meaning "man-power". Robert de Mundegumri was the first recorded namebearer in Scotland, a charter witness in circa 1165. 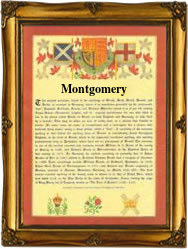 The Montgomeries were granted the earldom of Eglington in 1507. Sir Bernard Montgomery, the British Field Marshall of the Second Word War, was arguably the most successful army commander since the days of the Duke of Wellington in 1815. The first recorded spelling of the family name is shown to be that of Hugo de Montgomeri. This was dated 1086, in the Domesday Book of Staffordshire, during the reign of King William 1st of England, and known as "The Conqueror", 1066 - 1087. Throughout the centuries, surnames in every country have continued to "develop" often leading to astonishing variants of the original spelling.